As life in the Mesozoic was dominated by reptiles, including dinosaurs, it is often called the “Age of Reptiles”. As the Mesozoic opened, there was only one continent, Pangea. Pangea did not just form and then sit stationary for millions of years; tectonic activity continued throughout the era. Evidence from fossils (types of organisms) and sedimentary rocks (formation from sand dunes) indicate that the interior of Pangea was quite arid. As plates shifted, rifts developed and sea water periodically spilled into the rifts. In between periods of flooding, evaporating water left behind salts (evaporites). Measurement of the ages of these salts gives geologists a calendar of the opening of the rifts and therefore the development of the inter-continental oceans. 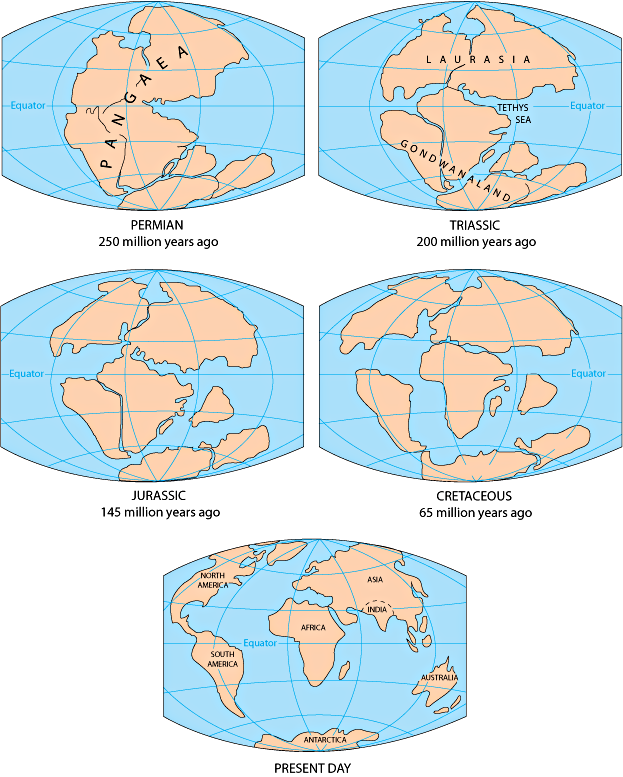 The main geological event of the Mesozoic was the breakup of Pangea into seven major continents. Around the end of the Triassic, around 175 Mya, Laurentia rifted and what would become the North Atlantic opened up. As the Tethys Sea penetrated into the flank of Pangea from the east, the two seas joined and split the supercontinent into its two major components, Laurentia1Or Laurasia. in the north and Gondwanaland in the south. A huge mountain chain which had stretched diagonally across the great continent left its remains in the Appalachians of North America and the mountains of Ireland, northern Scotland and western Scandinavia. Around the end of the Jurassic, 50 million years later, Gondwanaland rifted and South America and Africa began to separate, the South Atlantic Ocean opening between them. Antarctica and Australia broke loose from Gondwana and India, from Africa. Note that Laurentia and Gondwana were originally formed at the breakup of Rodinia, then fused to form Pangea, before again breaking apart at the end of Pangea and fragmenting into seven continents. The resulting changes in continental and oceanic configurations brought about changes in the climate. It is thought that the climate during this era was generally warm, with a reduced temperature gradient between the equator and the poles. This spurred evolution, for instance, through the creation of new econiches. The ancient “mascot” of the Paleozoic, the trilobite, did not survive the end-Permian extinction. This diverse group of arthropods had proliferated in the seas for over 250 million years. In terms of longevity, they beat out the soon-to-become-dominant dinosaurs. Nor were there any reefs during the early or middle Triassic. It is amazing anything did survive. The extinction was like pushing the restart button for life on Earth. But survive, it did. An expansion in the numbers of plankton brought about abundance at the bottom of the food chain. Skeletons of these tiny beings, which precipitate to the sea bottom after death, contain calcium carbonate and silica. They pile up on the sea bed to form chalk, hence the name, cretaceous. The cliffs of Dover have their origin in these minuscule creatures. Elsewhere, along the edges of the Tethys Sea, organic material decayed and metamorphosed to produce the oil found today in places like Russia, the middle East – the source of so much pollution and conflict. Marine reptiles of new sorts appeared. The ichthyosaur, a giant fish-like marine animal was a land reptile which had returned to the sea but continued bearing its young alive. However, it was not the ancestor of current whales or dolphins. Some land plants survived the extinction. Forests of conifer and ginkgo trees, among others, grew up. Flowering plants (angiosperms) showed up only late in the Mesozoic, around 100 Mya, but quickly spread to all environments. Such plants produce seeds which, like the amniotic egg for animals, are furnished with a protective skin and and plentiful nourishment. Through nourishment and pollination, plants and insects have co-evolved ever since the Cretaceous. Plants developed colors and structures that protected them from all but specific insects. Insects simultaneously developed so as to live off certain flowers. Flowering plants and insects form an inseparable symbiosis. Think ecology. The acknowledged stars of the Mesozoic were the reptiles, who came to dominate the sea, the land and the air for almost 200 million years. 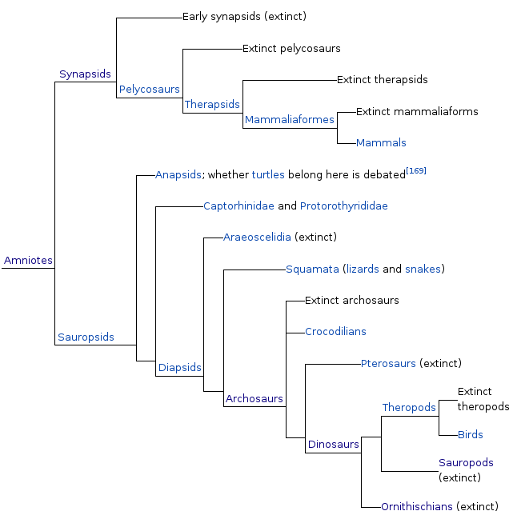 Dinosaurs diversified by occupying econiches left vacant by the animals killed off in the end-Permian extinction. They evolved to eat vegetation, meat, fish and even insects. They lasted so long and went so far that, had they had historians or philosophers, these might well have thought that they were the end product of evolution and, so, eternal. How about that? So-called stem reptiles2Or captorhinids; ancestors of archosaurs. already had been around at the end of the Permian, having evolved from amphibians. Although their numbers were greatly diminished by the end-Permian extinction, they made a comeback in the early Mesozoic. At that time, there were principally two types of reptiles which had survived the extinction. The cynodont (of the therapsid group) was one of the lucky survivors from the late Permian. It was a mammal-like reptile and had skin instead of scales. It probably had hair and whiskers and may have been endothermic (warm-blooded). In spite of being a reptile, details of its skull and jaw were mammal-like. It remained small and furtive throughout the Mesozoic, living in burrows by day and sneaking out at night to scavenge or hunt for insects. Among its descendants is the species Homo. The other surviving reptiles were the archosaurs3Again, there is disagreement as to whether the archosaurs are the animals discussed here or others which appeared only in the early Triassic., whose current descendants include turtles, snakes, lizards, crocodilians and birds. They also evolved into dinosaurs. The oldest dinosaur fossils date from around the early Triassic, 240 Mya. The fossil record of dinosaurs is extremely incomplete, but it is known that they spanned the globe, largely due to their amniotic egg and scaly skin, which enabled them to live far from the sea. As Pangea started breaking up in the Jurassic, the climate grew moister, making a much greater area habitable by animals. 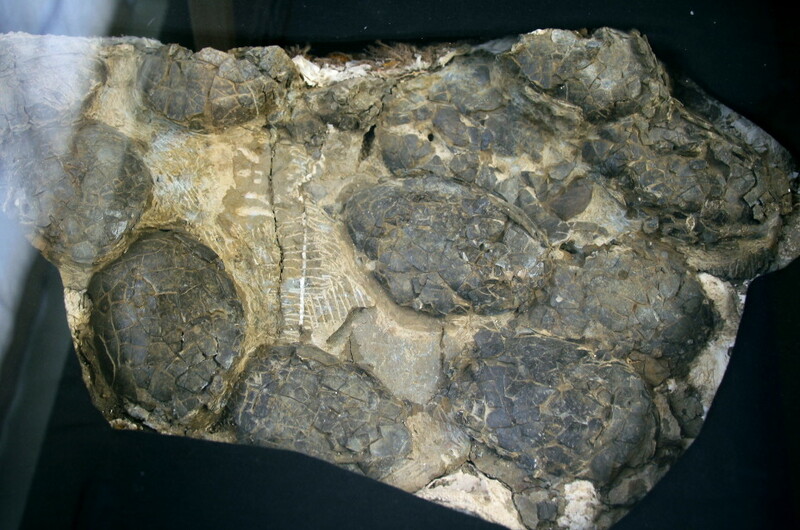 Dinosaur eggs from Museu da Lourinhã, Portugal. Photo by author. The boundary between these two periods was marked by the Triassic-Jurassic mass extinction. This extinction occurred in two or three steps across some 18 million years. Although various causes are ascribed, it is known that at least half the species on Earth disappeared, allowing dinosaurs to take over as the dominant species. So the Jurassic was to be the age when dinosaurs ruled. It is not certain whether dinosaurs were warm or cold-blooded. The biggest ones would have needed high blood pressure in order to pump blood from the heart to the brain, many meters away, maybe even in an upward directions; this would have implied a mammal-like circulatory system, making them warm-blooded. The first dinosaurs were quite small, about 1 meter long. Many of them were bipedal. In the course of their long reign of almost 200 million years, they diversified and evolved. 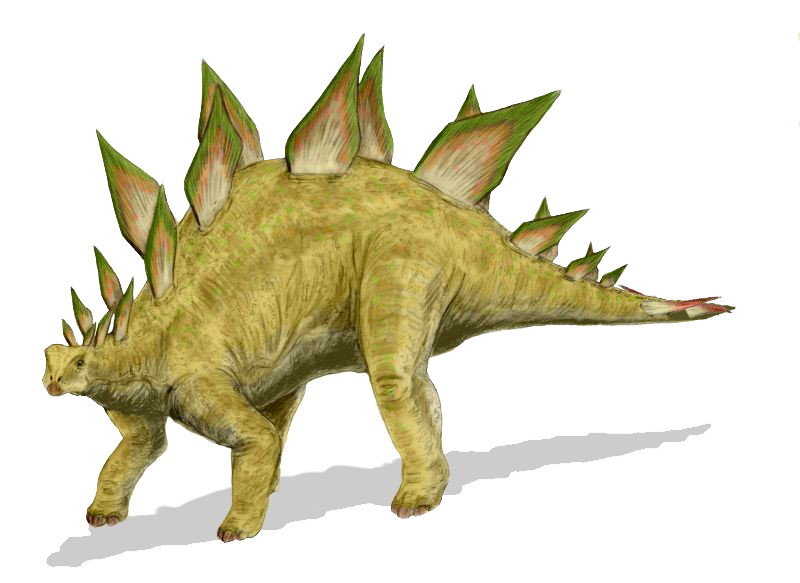 Many grew larger or developed defensive armor, like the stegosaurus or the triceratops. Dinosaurs did evolve quite a lot, and not all species of them lived simultaneously. The fight between Tyrannosaurus rex and Stegosauras during the excerpts from Le sacre du printemps in the original movie “Fantasia” could not have taken place, as these animals lived at different times. Paleontologists identify two types of dinosaurs, based on the bones of their hip and pelvis: ornithischian ( “bird-hipped”) and saurischian (“lizard-hipped”). The bird-hipped dinosaurs could be either bipedal or quadrupedal and were all herbivores. The stegosauraus was one of them. The lizard-hipped dinosaurs are in turn divided into two groups: sauropods and theropods. Sauropods were the commonest and were huge, including some of the largest land animals ever, diplodocus. Theropods were all bipedal and carnivorous and included the infamous tyrannosaurus. Characteristics of a very limited number of dinosaurs are indicated in the following table. Some of these dinosaurs are pictured in the following gallery (not to size).4The links, which I cannot get into the captions without their giving errors are as follows. 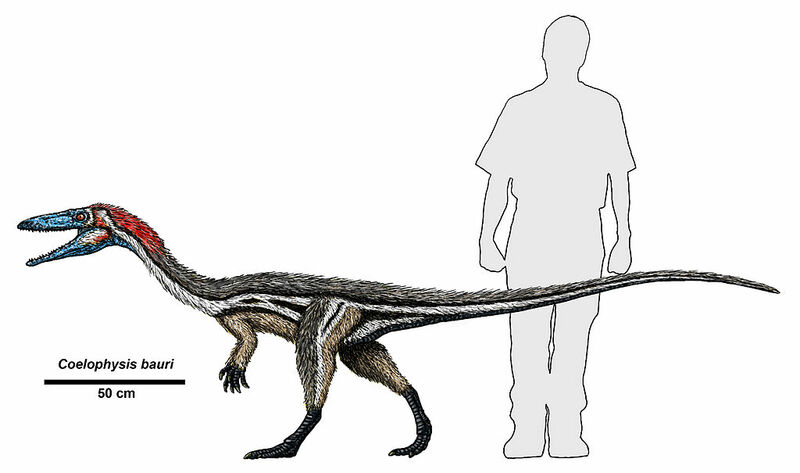 (1) “Coelophysis size” by Dr. Jeff Martz/NPS, https://commons.wikimedia.org/wiki/File:Coelophysis_size.jpg. (2)”Seismosaurus” by ДиБгд, https://commons.wikimedia.org/wiki/File:SeismosaurusDB.jpg. (3) Triceratops by Nobu Tamura, https://commons.wikimedia.org/wiki/File:Triceratops_BW.jpg. (4) “Stegosaurus BW” by Nobu Tamura, https://commons.wikimedia.org/wiki/File:Stegosaurus_BW.jpg. (5) Tyrannosaurus rex by Matt Martyniuk, https://commons.wikimedia.org/wiki/File:Tyrannosaurus_rex_mmartyniuk.png. Birds only evolved in the late Jurassic, 140-150 Mya. One of their reptilian fore-fingers grew long enough to support a web of skin which helped the animal to plane in the air – the first wing. The early pterosaur (“winged lizard”) was a flying reptile, not yet a bird. Birds and pterosaurs evolved from reptiles along separate lines (following figure). The transition between reptiles and birds is thought to be archaeopteryx, which had a reptilian skeleton but possessed feathers formed for flight. This made it a better flyer than the pterosaur. During the Cretaceous, these animals developed hollow bones like modern birds. It is now known that a number of dinosaurs had feathers, which probably served as insulation since they did not have the asymmetric form needed to act as an airfoil. The world was now enormously different from the Paleozoic, enhanced (from our point of view) by flowers and bird song. At the end of the Cretaceous and just before the Tertiary, there was another great extinction. Though much less serious than the end-Permian extinction, this one has captured imaginations more. This is partly due to the fact that it brought about the end of the dinosaurs, except for birds, thereby permitting the rise of mammals and the eventual arrival of humans. It is also due to the explanations offered for the extinction. One explanation depends on volcanic explosions in the Deccan Traps, in what is now central India. The other explanation cites the crash of a mammoth asteroid into the Earth on the coast of what is now Yucatan, forming the Chicxulub Crater. Both events occurred very near the K-T border. The asteroid would have caused a massive tsunami. Both events would have flung debris and gases (sulfur dioxide and carbon dioxide) into the air, darkening the planet and reducing temperatures.5According to one study, temperatures would have been reduced by at least 26°C, which would have brought about temperatures around -15­C. http://onlinelibrary.wiley.com/doi/10.1002/2016GL072241/abstract or http://passeurdesciences.blog.lemonde.fr/2017/01/23/les-dinosaures-sont-morts-de-froid/. Cooling surface waters would have brought up nutrients from below and favored plankton blooms, affecting plant and animal life. The result was the disappearance of some three quarters of plant and animal species on Earth, including ammonites and dinosaurs. Fossil evidence shows that the extinction was world-wide. But some members of each group of organisms managed to survive into the Cenozoic Era. Scientists usually count five major mass extinctions, which are summarized in a preceding figure and in the following table. the Quaternary (from 1.8 Mya). Each period is broken down into two or three epochs. Some scientists consider that we now are living in a new epoch, the Anthropocene, dating vaguely from the beginning of the Industrial Revolution (or perhaps the beginning of agriculture), but the term has not yet been accepted by any official geo-chronological body. The Cenozoic Era has been called the age of mammals, but it could equally well be called the age of orogeny, or mountain-building. The band of mountains running from North Africa to Indonesia, including the Atlas, Pyrenees, Alps, Taurus and Himalayas, was formed during the Cenozoic. During the Cretaceous, Eurasia and Africa were separated by the Tethys Ocean. When the Atlantic started to spread out and Africa broke loose from Antarctica, it floated northwards towards Eurasia. Initially, small bits of continents within the Tethys (now Spain and Italy) were pushed up and joined to southern Europe, forming the first Alps and Pyrenees. As Africa continued its journey north, the Tethys was closed and the Mediterranean formed. Subduction due to Africa’s continued northward push is responsible for the volcanoes around southern Italy, Sicily and Greek islands like Thira (Santorini). In a similar way, the Arabian plate moved toward Turkey and pushed up the Taurus Mountains. This plate too is still moving and is responsible for earthquakes in the Middle East. With the breakup of Gondwanaland, what is now India started moving north. Around 55 Mya, it entered into collision with Asia, administering the coup de grace to the Tethys. The crust of India was too light to be subducted, but some of it slid in under Asia, making the continental crust there almost twice its maximum elsewhere. The result was the chain of the mighty Himalayas and the high Tibetan plateau. 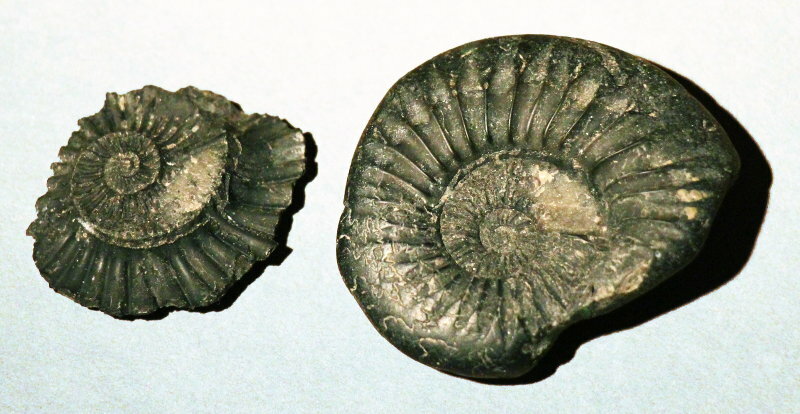 In both places, at thousands of meters above sea level, there are sedimentary rocks from the floor of the Tethys, with accompanying fossils, such as the ammonites called shaligrams, which are worshiped by Hindus as an incarnation of the god Vishnu (him again!). India’s encroachment on Asia is still going on at the rate of around 2 cms per year. This process leads to buildup of tension in the rock which, when released, causes enormous earthquakes in China. As summer heat warms up the high Tibetan plateau, moist tropical air is drawn in. When this precipitates, it brings about the monsoon. This weather phenomenon is both good (irrigation) and bad (flooding and mudslides) for India and Bangladesh. Since the Earth’s surface maintains a fixed area, the expansion of the Atlantic Ocean causes the squeezing up of the Pacific. As the Pacific plate has subducted almost all the way around its perimeter, volcanic activity has arisen there – the so-called Pacific Ring of Fire. Geologists originally distinguished the boundaries between different geological ages by relatively sudden observed changes, such as significant modification of the fossil record. Only later did they learn why such changes had occurred. 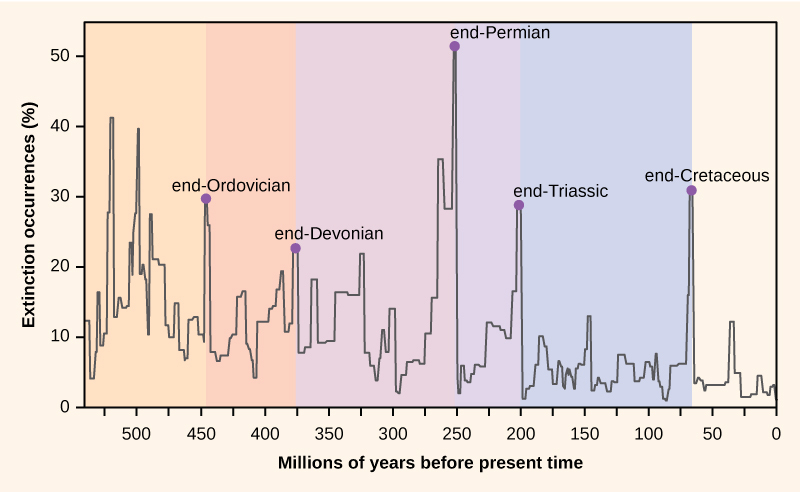 The Paleocene-Eocene boundary is at the “moment” of the Paleocene-Eocene Thermal Maximum, or PETM, also referred to as the Great Warming, which can be seen clearly as a narrow peak on the graph of temperature change in the Figure. Data from sediment cores of about 55 Mya show a strong “isotope excursion” over a period of around 110,000 years and a lack of carbonate deposits (from dead organisms) over about 60,000 years.8MacDougall 2011, 174. These data indicate that a sudden, huge amount of carbon was added to the atmosphere — as CO2 and methane. Ocean currents were also disrupted. These changes occurred at the same P-E boundary where it was already known that many foraminifera species (of ocean plankton) became extinct. It has since been found that the isotope excursion was world-wide, on land, in oceans and in the atmosphere. It also shows that much of the carbon was ejected in the form of methane, but there is still disagreement as to its source. Nevertheless, the picture which has emerged is that the normal equilibrium of the carbon cycle maintained by volcanic eruption and chemical weathering was overpowered by short-term processes. The result of all this greenhouse gas was an increase in atmospheric and oceanic temperatures between 5°C and 10°C.9MacDougall 2011, 178. At the beginning of the Oligocene Epoch, about 34 Mya, temperatures started falling steeply, leading to the ice ages of the Quaternary. Temperatures can be deduced from the shape of fossil leaves and from the isotopes of oxygen in limestone formed in the sea. The two methods agree well on the high temperatures of the Eocene epoch and the sharp drop at the beginning of the Oligocene. In the next chapter (Paleontology), we will see the important influence of these climate variations on primate development. The origins of these temperature shifts are found in plate tectonics. The existence of a large antarctic continent meant that sea waters had to flow around the whole continent. But when Australia and South America separated from Antarctica in the Cenozoic, it became isolated in a circuit of cold waters and a permanent ice cap gradually formed, around 10 Mya. In a similar way, the closing of the Atlantic-Pacific connection by the formation of the Isthmus of Panama 3-4 Mya brought about reinforcement of the warming Gulf Stream, good news for Europe. But this led moisture up to the north, where it precipitated and soon formed a polar ice cap there. Ice caps bring about global cooling. Plate tectonics influences climate which, in turn, influences evolution. The still-controversial uptake hypothesis suggests that the chemical weathering of recently-exposed rock removes CO2 from the atmosphere. If so, then formation of the Himalayas might in this way have contributed to global cooling. Since the beginning of the Quaternary, there have been a series of glaciations, or ice ages, with periods of roughly 100,000 years. These cycles, called Milankovitch cycles after the mathematician who first calculated them (without a computer! ), have been shown to depend on the Earth’s orbit, its rotation and its distance from the sun. This repeated glaciation has shaped the Earth through erosion and displacement of rocks. The last great ice age started about 130 Kya and left northern Europe and America only around 12-15,000 years ago. We are now living near the peak of a relatively warm interglacial period, but there is no reason to expect that to last indefinitely. Computer models incorporating Milankovitch cycles, continental configurations, atmospheric composition (CO2) and many other factors are currently used to predict the future of global climate. As the Mesozoic was the age of reptiles, so was the Cenozoic the age of mammals. During the Tertiary, mammals took over the econiches left empty by the then-extinct dinosaurs, just as these had occupied econiches left vacant after the end-Permian extinction. Like the dinosaurs, mammals rapidly grew in numbers and varieties. They currently range in size from mice to elephants, and of course whales. During the ice ages of the early Quaternary, some grew to be enormously big: a huge rhinoceros-like animal; elephants and mammoths; whales, which include the largest animal ever, bigger even than the largest dinosaurs; various large animals like camels, elks, sloths, bears and so forth. Although their size made them well adapted to cold climates, most of these megafauna died out about 13 Kya, for reasons which are still not understood. The Earth has been around for 4700 million years and mammals since something like 250 million years but only in great numbers for 65 million years. Man has only been around for at most 4 million years – and even then he did not bear much resemblance to us. But that is for the next section (What paleontology tells us). Plate movements are not finished. At this moment, Africa is on the move. The entire continent is moving slowly northward, causing volcanic activity on mainland Italy (Vesuvius) and Sicily (Etna). One day, Africa will smash (slowly) into southern Europe, raising new mountain ranges and obliterating the Mediterranean Sea. Meanwhile, within Africa, the Great Rift Valley is threatening to break off all of East Africa into a new (small) continent, with a new ocean in between it and the rest of Africa. And who knows what will become of poor little Iceland or the eastern edge of North America? The dance continues. Temperature and sea-level variations will certainly continue. In the long run, whatever that may turn out to be, there is no reason to expect the climate to remain friendly to the human species. Bacteria, not prokaryotes or eukaryotes are the basis and the necessary ingredient for life on Earth. We depend on them, not the other way around. One day we will go the way of the trilobites and the dinosaurs – and probably much sooner than they. For more, go find out what paleontology tells us. 2. ↑ Or captorhinids; ancestors of archosaurs. 3. ↑ Again, there is disagreement as to whether the archosaurs are the animals discussed here or others which appeared only in the early Triassic. 4. ↑ The links, which I cannot get into the captions without their giving errors are as follows. (1) “Coelophysis size” by Dr. Jeff Martz/NPS, https://commons.wikimedia.org/wiki/File:Coelophysis_size.jpg. (2)”Seismosaurus” by ДиБгд, https://commons.wikimedia.org/wiki/File:SeismosaurusDB.jpg. (3) Triceratops by Nobu Tamura, https://commons.wikimedia.org/wiki/File:Triceratops_BW.jpg. (4) “Stegosaurus BW” by Nobu Tamura, https://commons.wikimedia.org/wiki/File:Stegosaurus_BW.jpg. (5) Tyrannosaurus rex by Matt Martyniuk, https://commons.wikimedia.org/wiki/File:Tyrannosaurus_rex_mmartyniuk.png. 5. ↑ According to one study, temperatures would have been reduced by at least 26°C, which would have brought about temperatures around -15­C. http://onlinelibrary.wiley.com/doi/10.1002/2016GL072241/abstract or http://passeurdesciences.blog.lemonde.fr/2017/01/23/les-dinosaures-sont-morts-de-froid/. 6. ↑ Causes from Wikipedia, Ibid., and BBC Nature. “Big five mass extinctions”, http://www.bbc.co.uk/nature/extinction_events. 8. ↑ MacDougall 2011, 174. 9. ↑ MacDougall 2011, 178.